Emergency Business lockout, lock change and repair in Atlanta, Brookhaven, Chamblee, Tucker, Norcross, Dunwoody, Smyrna, Decatur, Stone Mountain and all surrounding areas. Overall, crime numbers are down across the nation. However, that doesn't mean you should let down your guard for one minute. That's especially true as a business owner. You've invested too much time and energy to get your business up and running only to have it brought to a halt by a thief. You need to take a proactive stance when it comes to your business' security. That's where the certified technicians working for QuickPro Locksmith will be a huge asset. Your first line of defense is all the locks on your doors, windows, gates and garage openings. When was the last time you had these locks inspected? The certified locksmiths working for QuickPro Locksmith can provide a top to bottom review of your lock situation. Where they see a weakness, they can recommend an upgrade for your locks. However, the security enhancements don't have to stop there. QuickPro Locksmiths can also install a variety of access control systems. The simplest is a "buzz" entry that allows your employees to control who can come into your business. There are additional alarm systems that can be installed which will provide an extra layer of security when the business is locked up for the night. You need to constantly ask yourself, "Is my business safe?" QuickPro Locksmiths will help get you there. Beyond your doors, gates and windows there are additional security measures that QuickPro Locksmith can help you with. This would be installing locks on file cabinets, desks, mailboxes and other sensitive material storage areas. The issue of key access should also be a concern to for your business. Depending on the size, it is conceivable that several people will have access to keys to your building. What happens when one of those persons is let go? Should you change the locks as you would at your home? Only you can make the determination as to whether that termination could create problems. What you can depend on is that QuickPro Locksmiths can provide a rapid response to your business to replace those locks. Because of our extensive fleet of licensed locksmiths, we're able to provide fast, same day service for any type of locksmith situation. Then there is the issue of a master key to consider. If your key ring is a jumbled mess of keys, QuickPro Locksmiths can rekey all of your locks and replace them with a single key. This will help you keep track of the keys you hand out and make your overall security more efficient. Even with the most strident security measures, you could still face an unwanted intrusion. The goal is to keep the thieves at bay. While they attempt a break-in your alarm systems can trigger a response from the police. However, they might result in some damage to your locks. One call to QuickPro Locksmiths will have a professional locksmith dispatched to your business location to replace those locks. Doesn't matter what time of the day or night, QuickPro Locksmiths will be ready to take that call. 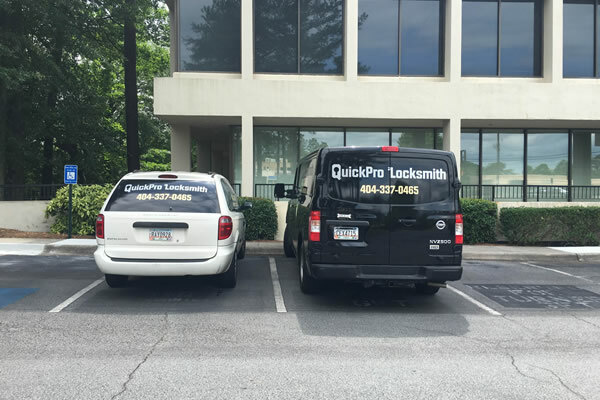 QuickPro Locksmiths covers the entire Atlanta area including Brookhaven, Decatur, East Point, Sandy Springs, Tucker and Chamblee. The locksmiths working on our teams have been trained to handle a wide variety of lock and security systems. Often, this training comes directly from the lock manufacturers themselves. The more certifications our locksmiths receive, the better off they are to serve you. Yes, we're constantly sending our locksmiths back to school! 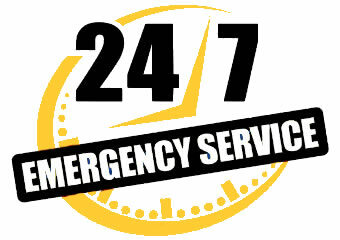 Each of our locksmiths has a mobile service van equipped to handle any type of lockout or lock replacement situation. Bottom line: if it has anything to do with locks or security, QuickPro Locksmiths is the only call you should make. Our service representatives are standing by to help. Call today for a free estimate.